Last year, the Pac-12 burned its best teams with tricky road trips—and found itself on the outside looking in on the College Football Playoff. That problem has been fixed, but there’s more work to be done and lessons to learn from the way other leagues build their schedules. Larry Scott and the Pac-12 get bashed pretty mercilessly these days for a variety of reasons. A yawning revenue gap between the league and the other Power 5 leagues tops the list. That situation hinges mainly on issues outside the control of the conference office, though. For example, Pac-12 schools can’t make their fans care as much as fans of Big Ten and SEC schools care. But the Pac-12 can help its athletic departments succeed in the sport that matters most—which, unfortunately for the league, isn’t water polo. That’s why today we come bearing praise followed by a sliver of gentle criticism. Last fall, a Pac-12 coach lamented to me that his league doesn’t engage in “scheduling for success” as the ACC and SEC do. The coach, who obviously didn’t want the quote attributed to him for fear of riling the league office, probably was still being too nice. Last year, it felt as if the Pac-12 scheduled in a manner to keep its teams from competing for the College Football Playoff. And lo and behold, the Pac-12 missed the playoff for the second time in four seasons. That’s excellent. The league made a change that harms no one and could ultimately help everyone. Now it’s time for that gentle criticism. The league didn’t go far enough. It can help its teams more with a few tweaks to the schedule. And since schedules are made years in advance, the Pac-12 needs to move quickly to realize any benefit from the changes before the current media rights deal nears its expiration point and the realignment tilt-a-whirl spins again. Scott understands the criticism. “The culture has been very pure historically,” he said with regard to scheduling. “Some would say rigid.” An increase in Friday games and night games came with the media rights deal the Pac-12 signed in 2011, but the league did little to adjust to how these changes might affect the success of teams. Meanwhile, the ACC and SEC have changed their scheduling to help their teams. ACC and SEC teams play eight conference games, and both leagues allow teams to use the penultimate Saturday of the regular season for non-conference games—typically of the wet, hot garbage variety. This way, Auburn and Alabama aren’t wearing themselves down before playing one another in the Iron Bowl. Florida State gets a less rigorous opponent the week before it plays Florida. (And vice versa.) Ditto for Clemson and South Carolina in some years. There is nothing more sacred about the Saturday before Thanksgiving than there is the third Saturday in September, but these two leagues apparently were the only ones to notice. These games serve several purposes. They allow teams to enter huge matchups less beat-up, and they often allow each league’s teams to be as fresh as possible before playing Power 5 non-conference opponents. Remember, beating those teams helps the conference’s strength of schedule. Winning these games also allows the leagues to play much more interesting conference games in September weeks when they might have had a lineup of mostly non-conference stinkers. It is not an accident, by the way, that an SEC team has won nine of the past 12 national titles and ACC teams won two of the other three. The ACC and SEC also play only eight conference games, while the Big 12, Big Ten and Pac-12 play nine. No one is forcing those leagues to play nine, and the Pac-12’s conference schedule is a remnant from the Pac-10, when a nine-game conference schedule meant the league played a full round-robin. Scott said playing eight has come up in conference meetings, but it has been a non-starter mostly because Pac-12 schools need to play better games to get fans to show up. The ninth conference game gives members another quality game without forcing them to hunt for one. By the way, this need to get—and keep—butts in the seats will eventually be the thing that makes the SEC consider moving to nine conference games. Many of that league’s ADs are concerned about ticket sales, and even the ones who sell all their tickets can’t stand looking out to see half the seats empty during some games. They keep trying to enhance the fan experience to stem the tide, but the only way to truly enhance the fan experience is to schedule better games. The ACC likely would be the last league to consider going to nine conference games because five teams are forced each season to play a de facto conference game against Notre Dame. But instead of complaining about the way the ACC and SEC have outsmarted the other leagues, the Pac-12 could choose to follow their example. That doesn’t mean the Pac-12 needs to drop to eight conference games. But it does mean the league could try to help its teams through scheduling. When asked about this, Scott assumed it was a question about giving potential national title contenders an easier path. “No favoritism has been shown to any school,” he said. And none should be. What I’m suggesting isn’t favoritism but a choice to not actively work against the league’s teams. The Pac-12 absolutely kneecapped USC in 2017 by making the Trojans play 12 consecutive weeks. This was akin to 2010, when the SEC forced Alabama to play six consecutive opponents that were coming off open dates. Most teams wouldn’t survive those slogs with their national title hopes intact, and neither of the teams mentioned did. The reason given last year was that USC’s need to play at Notre Dame in October left the Pac-12 no other option, but with a more flexible schedule that has other Pac-12 teams besides USC and Stanford playing non-conference games later, other choices would be available. The Pac-12 isn’t opposed to playing conference games early, by the way. Last year, the eventual Pac-12 title game matchup (Stanford versus USC) played out in Week 2. Scott said that currently a computer spits out the Pac-12’s conference schedule around the previously scheduled non-conference games. League staffers then adjust for situations such as the Saturday road game into Friday road game situation. Perhaps those adjustments need to be made more carefully. Also, while the league should make every effort to ensure none of its teams are treated any differently than the others, the Pac-12 has no such responsibility to anyone else’s teams. If a Pac-12 team happens to get an open date or an easier conference or non-conference opponent before facing a quality non-conference opponent, that’s good for the league. A Pac-12 team winning against that quality non-conference opponent helps the league’s perception with the playoff selection committee. Putting a team in the playoff increases the league’s prestige and makes more money for a conference’s members. The ACC and SEC figured this out years ago, and their conference offices began working for their teams. Scott doesn’t seem fundamentally opposed to the idea of scheduling for success. He also wasn’t opposed to being more flexible for television, and that helped bring the league’s media rights deal out of the stone age. Perhaps it’s time for another paradigm shift so the Conference of Champions has a better chance to compete for a national championship in the most important, most lucrative sport. “Given the stakes of the playoff, should we re-evaluate?” Scott asked rhetorically. The answer, of course, is yes. And your schools should have done it yesterday. Most love songs are told from first- or second-person point of view, so we rarely know the names of the lovers. Perhaps this is to help the listener imagine himself/herself in the place of the subjects of the song. But some tunes do name their main characters, so let’s rank the most loving couples named in song in order of most loving to yikes. They’ve got each other, and that’s a lot for love. They’ll give it a shot. No romance has had so many people rooting for its ultimate success. Patti’s parents didn’t understand their love, so they just ran away. They got a little place by the coast and had some fun. Now they’ve got a 10-pound baby boy and they’re about to settle down. My guess is Patti’s parents got Billy’s letter—which probably also included a photo—and their hearts melted. This one is going to turn out O.K. Tony got shot defending Lola’s honor. These two were deeply in love, and that makes Lola’s descent into madness even sadder. When you begin your life together under the premise that the thrill of living will be gone in 10 years, that doesn’t exactly inspire optimism. Jack and Diane probably got divorced in their mid-30s. Meanwhile, Katie and Tommy still have date night at Pizza Hut after Tommy gets done coaching Little League. They burned bright and they burned out. But at least they got a few years of deep pile carpet out of the deal and stayed friends. “Now you just say ‘oh, Romeo, yeah, you know I used to have a scene with him’” is one of the most crushing lines ever committed to vinyl. Like Billy Joe and Bobby Sue, Kelly and Sara are awful people. Kelly is an actual criminal. Sara is a sorority girl who thinks it’s fun to watch crimes get committed, but she eventually joins in for a bank heist in Mobile. The narrative gets a little murky, but the assumption is Kelly isn’t going to make it—either because he’s dead or because he took the rap so Sara could go back to her life. He asks her to think of him every time she swims in the Gulf of Mexico. Yes, Billy Joe murders someone during a home invasion. But they’re still running today—presumably together. Since Billy Joe and Bobby Sue’s interests range from smoking pot and watching TV to capital crime, here’s hoping they didn’t reproduce. Frankie catches Johnny cheating and shoots him dead. Do not step out on Frankie. 1. It may be time for a fourth edition of Cheating For Dummies, because the sheer stupidity of this latest example is astounding. Oregon State mailed recruiting information to several current Hawaii players. But the Beavers didn’t mail it to their hometowns. They mailed it to the Hawaii players on Hawaii’s campus. Tampering happens all the time in college sports, but there’s a way these things are done. You call the player’s high school coach and say something to the tune of “Hey, are all your former players happy at their schools?” You don’t mail the player a letter at his campus address. We can thank Hawaii coach Nick Rolovich for bringing this to our attention. Clearly the staff at Oregon State needs to sign up for my special three-day Cheating For Dummies workshop. Hopefully, the Beavers won’t mind that I only accept cash. 2. The Mark Richt–Georgia split continues to work out well for all parties involved. Last week, Miami announced that Richt received a contract extension through 2023 on the same day Georgia announced a new seven-year, $49 million contract for Richt’s successor, Kirby Smart. Rarely do things happen this perfectly. But Richt needed a push to get back to what makes him great—calling plays and working with quarterbacks—and Georgia needed a new voice. The Bulldogs’ decision to fire Richt helped Miami reach the ACC title game and helped Georgia win the SEC and reach the national title game. 3. In graduate transfer news, former Cal tailback Tre Watson is headed to Texas. Watson missed most of last season—and received a medical hardship waiver from the NCAA—after tearing his ACL in September. He ran for 709 yards as a junior in 2016. Meanwhile, former Syracuse defensive lineman Kayton Samuels is headed to Indiana. Samuels made 44 tackles in three seasons for the Orange. You probably read last week that Peter King will be leaving Sports Illustrated at the end of the month. He explains his reasons in depth in this week’s MMQB. I just wanted to take this opportunity—in a column with a format shamelessly lifted from MMQB—to thank Peter for everything he’s done for this company. I was hired by SI in 2008 to write for SI.com, and at the time there was a pretty thick wall between the magazine and the website. Peter, who helped create the template for building an audience through the web, broke down that wall. Now we’re a much better-aligned company. And, selfishly, Peter showing the folks here that the same people could write effectively in cyberspace and on the printed page allowed me to get my name on the cover of SI. But the greatest thing about Peter was the fact that he was the hardest working person at SI. No one produced more. No one devoted more hours. He could have coasted on a name he built a long time ago, but he kept right on building. Just keep my drink full. That’s the key to a great tip from me. It’s really very simple. If it’s low, top it off. I’ll probably be happy. It’s amazing how many restaurants—and how many servers—can’t master this simple concept. I’m positive I’m not alone. Full (or empty) drinks probably account for half the gratuity adjustments in the restaurant business. The owners of the U.S. 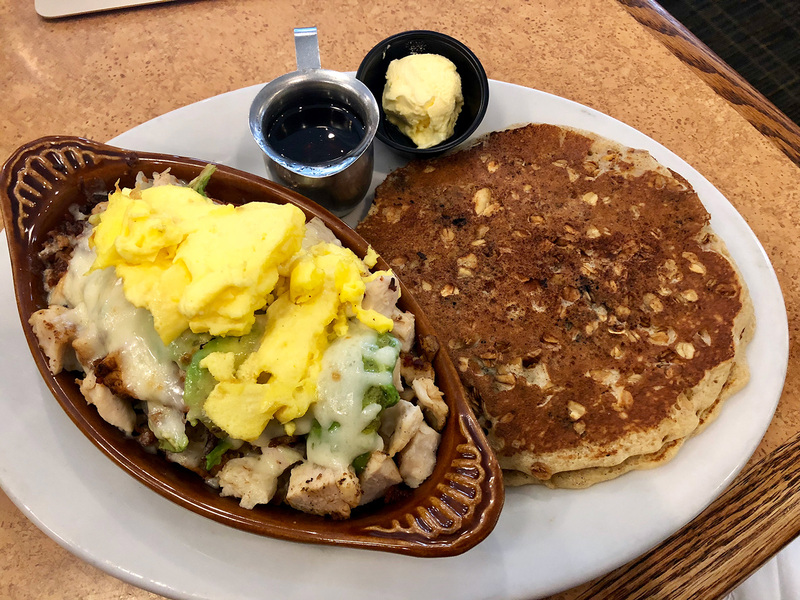 Egg chain in metro Phoenix must love their servers very much, because along with some truly wonderful breakfast food, they’ve armed those servers with a way to all but guarantee happy customers. What is this amazing, game-changing idea? Just leave the pitcher at the table. I arrived in Scottsdale at 10 a.m. local time last week. I’d awoken in my own bed in Florida at 4 a.m. Eastern that day and taken two planes to Phoenix. My body, thinking it was 1 p.m., demanded food of some kind. My brain, trying to grapple with the new time zone, demanded breakfast fare to help ease the transition. So when I noticed a breakfast spot across the street from my hotel, I dropped my luggage and sprinted over. After flying cross-country, I wasn’t sure if I needed to hydrate or to caffeinate. So I did both. I ordered water, iced tea and coffee. My server reappeared with pitchers of all three. She filled the various vessels, and then she left all three pitchers on the table. I’d had this happen when I was part of a party of 10. But I never realized how liberating it could be even as a party of one. Even before I’d tasted the first morsel of food, the meal was glorious. I didn’t have to slide my glass to the edge of the table. I didn’t have to shoot my server the side-eye as she tried to help people at other tables. If I drained a glass—which didn’t take long for the water after four hours crammed into seat 30F—I simply poured some more. My coffee cup was smaller than the cereal-bowl sized mug I use at home, but it didn’t matter. I just poured another. Of course, I wouldn’t be telling you about the joy of U.S. Egg’s beverage service if the food wasn’t spectacular. The place gets the breakfast basics perfect. Then it adds several twists guaranteed to make everyone happy. The two stars on the menu are the Idaho skillets and the protein pancakes. The skillets feature a combination of egg, another protein and vegetables over a bed of hash browns. The protein pancakes mix traditional batter with blueberries, granola, slivered almonds and cinnamon. Unless you plan on napping into the early evening, the order you want is the half and half. This is half a skillet with two smaller protein pancakes. The pancakes are only small in relation to the regular-sized ones. If those were made of metal, rap songs would have been written about them. The combination of the cinnamon, the almonds and the blueberries—the pancakes are stuffed with the fruit that landed No. 1 in a Random Ranking a few years back—renders syrup completely unnecessary. I didn’t think I’d ever encounter a pancake that didn’t need at least a few drops of syrup or a pat of butter, but this is it. I ordered the chicken, bacon, tomato and avocado skillet but subbed jalapenos for tomatoes. I made the quasi-mistake of ordering the egg scrambled the first time. On a subsequent visit, I ordered the egg sunny side up. That melange of flavor gets even better after piercing that yolk and letting it meander among the chunks of chicken, slivers of potato and slices of avocado. Those trying to lose weight don’t have to suffer, either. U.S. Egg will make any of the skillet concoctions as an omelet and pair it with a bowl of grilled broccoli. I went back another day and ordered from that side of the menu, and the result was a satisfying, low-calorie meal that kept me off the glycemic rollercoaster for the rest of the day. But guess what the best part of that meal was? That’s right. 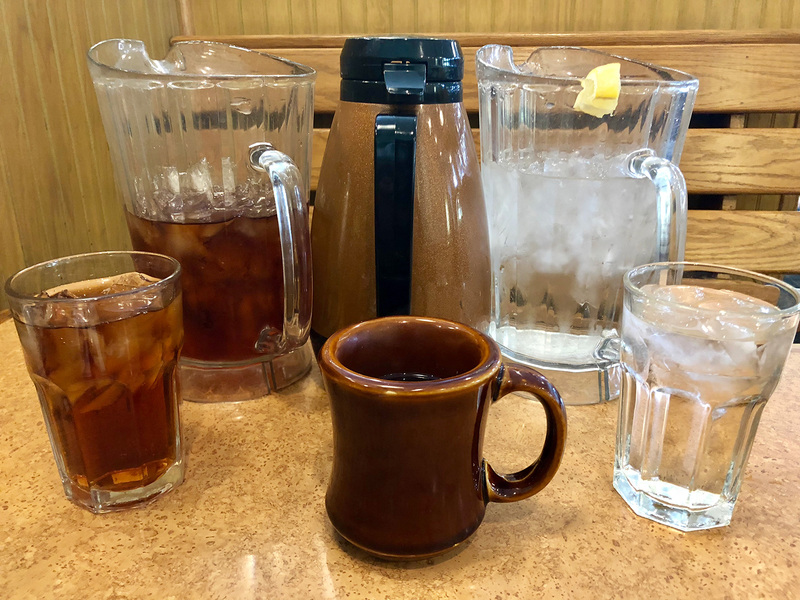 Pitchers of water, iced tea and coffee on the table so my cups always stayed full. Sometimes, the littlest things mean the most.